A young ghost named Kaz is swept away from his home and ghost family by a strong wind, finally coming to rest in a library. But it’s not just any library. 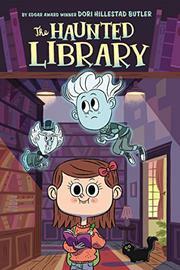 Claire, who has a special talent for seeing ghosts, actually lives in the library, which is run by her grandmother. Kaz, who has never had any contact with “solids” like Claire, has a lot to learn. He’s never been able—or willing—to pass through objects, making it especially challenging to hide from her, his initial plan. Eventually, the two team up to try to track down one of two apparent ghosts that already haunt the library. Could one of them be Kaz’s older brother, previously swept away from home? Or could Claire’s grandmother have a role in the mysterious appearances of one of the haunts? Butler provides the right amount of back story to settle readers in this ghostly world, as well as a few amusing new ghostly abilities; the story’s definite lack of creepiness ensures that this effort isn’t likely to scare anyone. Both Claire and, especially, Kaz are well-rounded characters, and the frequent cartoon illustrations of them, with wide, oversized eyes and simplified features set in large, round heads, don’t do them justice.